I never had the opportunity to take astronomy classes in school and I don’t think I ever contemplated it much. 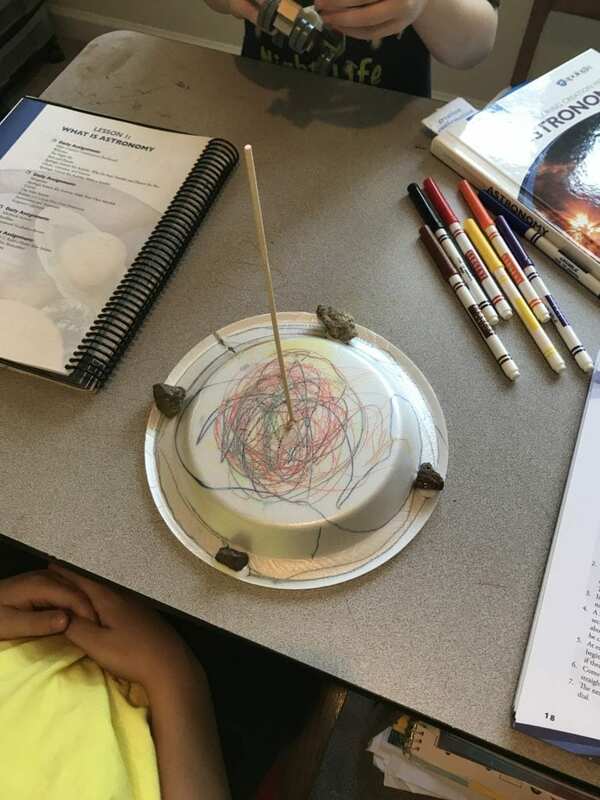 Then I became a mom to two boys who love everything about space and rockets and one of whom is enamored with history and navigation, which was done through the study of what? Astronomy. Disclosure: I received the Apologia Astronomy kit for review purposes. No other compensation was received and all opinions are my own. I was not required to post a positive review. To say I’ve learned more than I ever dreamed I’d know about the stars, planets, and how to locate the North star and measure with a sextant would be a bit of an understatement. When I asked around and found I was not the only homeschool mom privy to such fantastic but unknown studies, I felt much better. Astronomy opens the door to wonderful and deep conversations about the origin of Earth and the Creation story. Because God created the light for the day, the light for the night, and also the stars (paraphrased Genesis 1:16), there is a connection that children make to see the Creator in the creation. 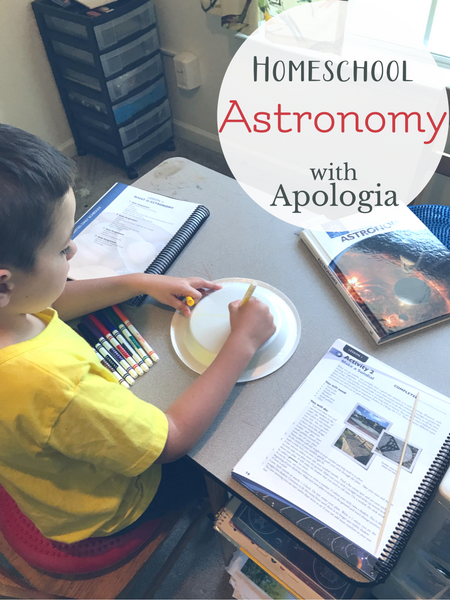 Apologia has the best homeschool astronomy course for young scientists desiring to learn about the cosmos. I say this because not only is the text book engaging and full of beautiful writing and images, but the note booking journals make the study interactive and utilize multiple methods to engage various learning styles. 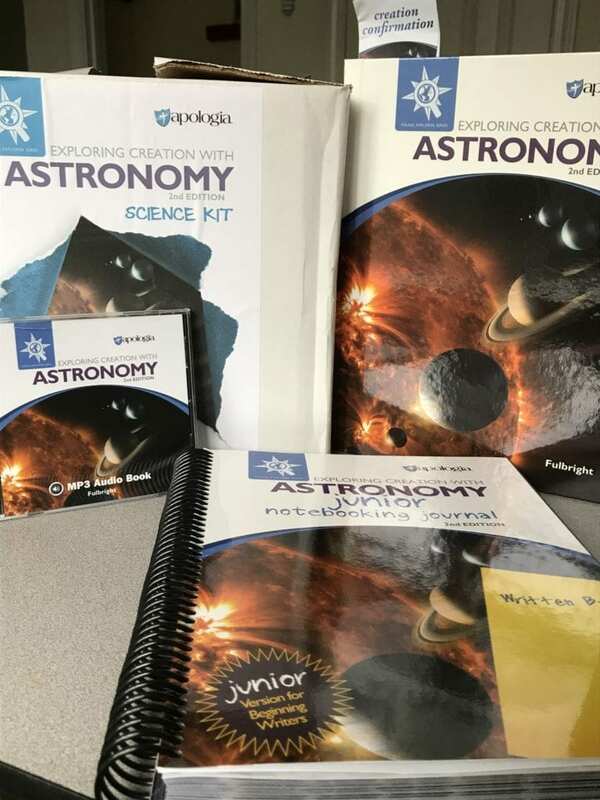 The Activity Kit contains everything you need to make your astronomy study come to life with guided experiments and observations. The MP3 disc allows for listening to the text over and over whenever your children wish to. Everything you need to have a complete and thorough study for elementary students of varying ages and abilities is available in one course. We made one big goof, apparently. We had to pause a significant number of our astronomy studies until we had acquired Mr. F his own junior not booking journal. He may be 4 going on 40. He adores writing, spelling, reading, and “maf”. (That is one mispronunciation I hate to correct but after 5+ years of speech therapy for Apraxia, I’m willing to make a concession.) He would have a ginger snap every time we started to do a lesson because he *needed* his own notebook. You can see below what he thought when he finally got one. 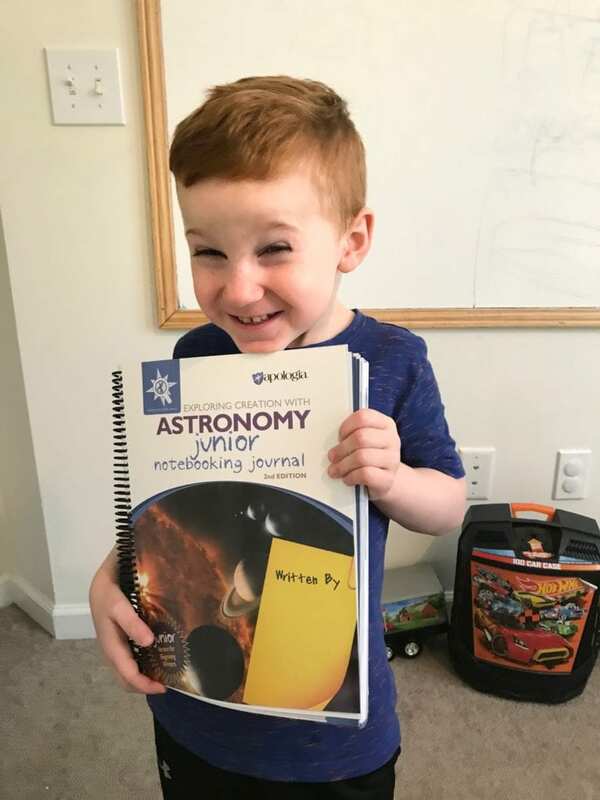 As you can see here, Mr. F is beyond thrilled to have his own Apologia Homeschool Astronomy Junior Notebooking Journal. There is something magical for a child when they get to learn and create their own book as they go. And the Notebooking Journals include text, cutting, pasting, and lots of lap booking elements as well. It isn’t just a “notebook” with worksheets to answer. It is an interactive learning tool. The Apologia Astronomy text book is written in a very lyrical style that gives it a beautiful prose feeling and keeps it from reading like a traditional text book. Jeannie Fulbright has really done a phenomenal job of keeping the text true to a Charlotte Mason living text approach. Had I had a book like this for my science studies growing up, I would have been much happier! The Audiobook MP3 is a great investment. Because of his auditory processing challenges, Mr. T has to hear things a few times over before they really “click”. Our set-up for this is that I read the text the first day and we go through all or part of the note booking journal activities (depending on how involved it is and how long it takes). The second day, we read the activity instructions and as the activity is completed, we play the MP3 through the computer if the activity can be done indoors. If not, we listen to it for the second time during read-aloud time in the afternoon. If we need a third listen, then I play it during our daily hour-long quiet time while the boys do LEGOs or color on the third day. This system does take a bit longer than just going through everything, but the beauty of homeschooling is that you get to go at the pace that suits your children. No one gets overwhelmed, and both my boys get to learn the subject matter well and have ample time to complete all the activities. Don’t miss Apologia Astronomy free Eclipse 2017 Ebook! You can get yours here.